By Mary Shomon Early on in his book, Dr. Datis Kharrazian asks, “If the check-engine light on your car lights up, which would be smarter: to investigate the engine or remove the light?” The book goes on to say that failing to look for the underlying reasons behind the symptoms — and instead, simply prescribing thyroid medication — is like “removing the engine light.” Looking for those underlying reasons for Hashimoto’s and hypothyroidism is the idea behind Dr. Kharrazian’s book, Why Do I Still Have Thyroid Symptoms? When My Lab Tests Are Normal: A Revolutionary Breakthrough In Understanding Hashimoto’s Disease and Hypothyroidism. At its core, Why Do I Still Have Thyroid Symptoms makes it clear that hypothyroidism is not a one-size-fits-all diagnosis, and while thyroid replacement treatment helps some people, it doesn’t necessarily resolve symptoms in everyone. Why thyroid treatment doesn’t resolve symptoms for everyone is the overriding question Dr. Kharrazian seeks to answer. To tackle this question, Dr. Kharrazian has outlined his theories regarding the causes of Hashimoto’s disease, as well as his explanation of the various causes of what he refers to as “functional hypothyroidism” — which he defines as hypothyroidism despite normal — or “euthyroid” levels on thyroid blood tests. He provides nutritional and supplement protocols, as well as dietary changes, that he feels will address and resolve Hashimoto’s and functional hypothyroidism. He also addresses the need to evaluate and manage blood sugar, digestive and adrenal imbalances, and outlines the tests and supplements needed to evaluate and treat each type of dysfunction. There is a great deal of thoughtful research in Dr. Kharrazian’s approach, and his recommendations are explained in depth, and with many citations and journal references. Dr. Kharrazian points to the two key directions to look for in the causes of hypothyroidism — Hashimoto’s disease, and six types of metabolic pathway dysfunctions. Looking at Hashimoto’s, the book delves into the immune system issues that may cause the disease, Dr. Kharrazian focuses on two different types of Hashimoto’s, what he refers to as TH-1 (TH stands for T-helper cell) dominant., where natural killer and T-cells that kill other cells are overproduced, and TH-2 dominant, where too many B-cells — the cells that identify immune-unfriendly intruders — are overproduced. He provides detailed recommendations regarding tests to assess these issues, and nutritional protocols he says will help modulate these immune responses. One of the areas where Dr. Kharrazian has been breaking new ground is in his information about the role of diet as a trigger for Hashimoto’s disease. Here, Dr. Kharrazian is presenting information that is similar to and complements the work of Kent Holtorf, MD and Dr. John Lowe, who have, for a number of years, been researching and writing about thyroid transport, impaired T4-T3 conversion, Reverse T3 dominance, T3 resistance, and other factors that prevent cells, tissues, and organs from effectively receiving enough thyroid hormone. The book provides detailed recommendations regarding tests and nutritional supplements for each metabolic dysfunction leading to hypothyroidism. 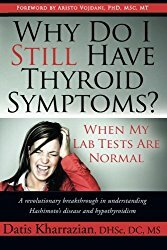 The one place where I question Dr. Kharrazian’s conclusion is in his assertion that primary hypothyroidism is the only pattern of hypothyroidism that can be “effectively managed with thyroid replacement hormone.” The book even states: “the majority of people with hypothyroidism do not need thyroid hormone medication. In fact, medication can make functional hypothyroidism irreversible.” In my opinion, this is overreaching. There is no question that nutritional approaches can help calm inflammation and alleviate some symptoms, and in a small subset of patients, even resolve a thyroid condition. But the evidence for the effectiveness of these approaches in actually treating Hashimoto’s hypothyroidism, or restoring thyroid function to normal, is still largely anecdotal, and comes primarily in the form of testimonials from other chiropractors and their patients. The issue that the book raises to me is that right now, the thyroid world is in desperate need of a meeting of the minds. We have endocrinologists who think that there’s no point in even knowing if you have Hashimoto’s disease, because, as many patients have heard, “it won’t change how we treat you.” Conventional physicians have absolutely nothing to offer patients who want to address the underlying autoimmune disease. And on the other end of the spectrum, we have overzealous chiropractors who may be taking things too far by unrealistically marketing the ability to “cure/treat” most cases of Hashimoto’s or hypothyroidism nutritionally without medication. There’s an old saying that goes, “to a man with a hammer, everything looks like a nail.” And to that end, we criticize conventional physicians for just handing out prescriptions as solutions to every ailment. But it seems equally open to criticism when some chiropractic practitioners, who can not prescribe medication but have as their “hammers” lab tests and nutritional supplements, then suggest that only tests and nutritional supplements can cure or treat Hashimoto’s and hypothyroidism. I’ve always believed that a “one size fits all” approach has no place in thyroid treatment. In my opinion, the truly patient-oriented approach is integrative, and incorporates the best from all disciplines. Most medical doctors, and in particular, endocrinologists, could benefit from a careful study of the issues Dr. Kharrazian raises, in particular, learning more about the immune system, the relationship to the thyroid, nutrition, and the factors that can impair the immune system and trigger Hashimoto’s disease and hypothyroidism. At the same time, some members of the chiropractic community need to make more realistic and supportable claims about treatment and cures, and recognize that more than a few thyroid patients need to continue thyroid treatment. For those patients, chiropractic approaches may complement and improve upon, but not replace, medical treatment. In my opinion, the best results for patients are likely to come when nutritionally-oriented holistic practitioners — including knowledgeable and ethical chiropractors — treat patients along side — but not necessarily instead of — medical doctors. That way, patients who require thyroid hormone can receive the medical treatment they need, while seeking to address and resolve underlying health issues. Overall, I think that Why Do I Still Have Thyroid Symptoms? is an excellent book for anyone with Hashimoto’s, and one that is best integrated into a patient’s broader thyroid bookshelf, much like many of the approaches outlined by Dr. Kharrazian can realistically be integrated into a broader approach to Hashimoto’s and hypothyroidism diagnosis and treatment. Final note: The book specifies that it focuses on hypothyroidism that results from Hashimoto’s disease and functional causes, and does not address solutions for patients with Graves’ disease, hyperthyroidism, or thyroid cancer.